During times of loss and grieving, funeral flowers are often common. 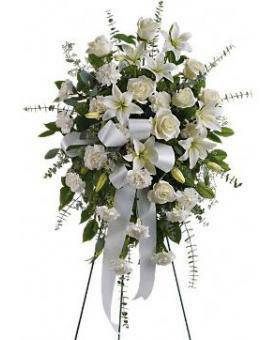 These blooms are used to show sympathy and express any condolences. These often provide comfort to survivors of those who have passed. The traditional flowers for funeral are both timeless and elegant. They are often the staples of creating floral displays for funerals. These are often appropriate for any type of service being held. Chrysanthemums are among the most common of the traditional blooms. White is often chosen to represent honesty, sincerity and truth. This demonstrates that the sympathy being expressed is sincere. For wreaths or sprays, double chrysanthemum blooms are often used. The fuller appearance can quickly create a larger floral display. Tribute wreaths may feature the name in white or in colored blooms. Those wanting a slightly less formal display may prefer single bloom. Single chrysanthemums have a more daisy-like appearance than doubles. These are often preferred for youth or female memorial services. Carnations are another popular option for funeral flowers delivery. Carnations have a classic appearance that lasts longer in displays. Carnation floral displays can easily keep for up to a week or more. Long lasting blooms are ideal for creating a shaped tribute or wreath. These are often left on the casket or placed at the graveside service. White carnations are often the top color of choice when available. White roses have a long standing place as common funeral flowers. Representing purity and love, they are given when loved ones pass. They may also be woven into casket sprays or in a tribute wreath. Some may choose to use red roses to show deep and sincere love. A large bouquet may be placed on top of the casket or at graveside. These often have thick greenery added to fill out the arrangement. Tall standing rose bouquets may also be used to express sympathy. Long stem roses are often gathered and placed in an ornate vase. Sprays of filler may also be added to create vibrant arrangements. Yellow is a commonly chosen color for sympathy and funerary blooms. It can represent love, respect and sincerity, especially with roses. Softer yellows may be chosen for a more formal and somber service. Exotic blooms may also be used for those wanting less tradition. Birds of paradise, exotic lilies or bromeliads may be selected. These may be combined in bouquets or crafted into a potted basket. Potted baskets are ideal for memorial gifts or tokens of remembrance. These may contain ivy or other dark greens and sprays of blossoms. These live plants can symbolize how life continues to grow after loss. For those who may be unsure of what to send, please check the website. There are many prearranged assortments available to choose from. This can help reduce some of the time needed to pick the perfect mix. The most popular bouquets and sprays are also available on the site. This can be helpful when seeking to create a more elaborate look. Exploring the site can make shopping for funeral flowers simple.